Last night (Saturday evening) was our last night in Beijing so we wanted to go out and see a few more sights after we spend some time in the hotel recovering from the morning of walking. I got in touch with an adoptive friend, Jennifer, that I knew through an online group and we decided to meet downstairs in the lobby. 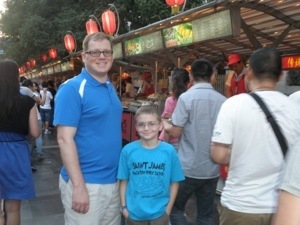 Our two families walked down the street a few blocks to Snack Street, which is also called the night market, because it is only open for a few hours in the evening. The children and I had looked at pictures online and they were excited to see the starfish, squid, and other gross things in person. What the internet doesn’t convey is the nauseating smell! Some areas were okay, but others we just kept walking quickly because the smell was so terrible. Not all of the food was gross. Quite a lot of it looked great. There were bowls of noodles, some baked goods, and every person who was selling fruit on a stick would gesture to our children and wave their fruit sticks enticingly at them. One stall had little pots and I was curious what they contained but we didn’t see an english sign for them. A few stalls were selling food that met Muslim standards. The most popular stall by far was one selling a large haunch of roasted lamb on a stick. After we finished the line of stalls we stopped for a bit to decide what to do next. 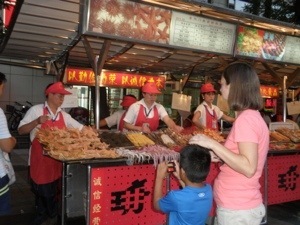 Our original plan had been to eat Beijing (Peking) duck tonight. But we were still really full from our huge lunch and Nancy had warned us that on a Saturday night it might be difficult to get seating for a party as large as ours without a reservation. We decided not to worry about the Beijing duck and we would get something light if we got hungrier later. We then headed over to a different street to visit St. Joseph Cathedral, which was built on the site of one of the original Jesuit missionary houses from the 1600’s. It had a nice public gathering area in front, but the church was closed with locked gates. 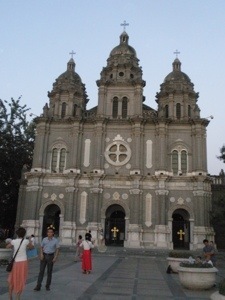 We had hoped to be able to go to Mass here on one of our days since the Beijing bishop is recognized by the Vatican but the only Mass time is 6:15 am, so we never made it. From St. Joseph’s we walked back to the area before the night market, which was a large shopping area that had a Times Square feel with large glowing billboards. 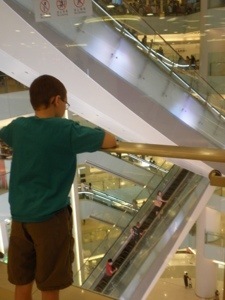 There was a multistory mall, which we entered through the Apple store. 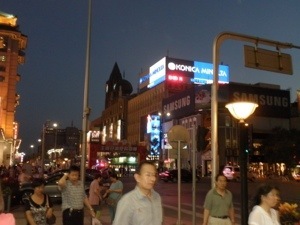 It was like any mall in America, with many of the same stores like Forever 21, only the signs were in Chinese. The mall had escalators for each floor, but since it had so many stories it also had “express” escalators that take up two stories at a time. We ended up eating some noodles at a shop there before heading back home. We stopped by the restroom before going back to the hotel because the kids had all had a full can of Coke. I’m not sure how they work these things out, but based on my experience in Beijing it seems like Coke has an exclusive contract for all of China. Not that I’m complaining! Anyway, I haven’t mentioned the restrooms yet. First, most places have what are called “squatty potties.” I’ll try to get a picture later if you don’t know what one looks like. Sometimes they will have one Western style toilet at the end. I actually don’t mind the squatty potty. It’s nice and sanitary because you don’t touch anything. Bathrooms may or may not supply toilet paper, and if they do it’s by the door and not in the stall. I brought travel kleenex packs to pass out as needed. You toss the used tissue in a trash can by the door, because the sewage system here can’t handle toilet paper, so most of the stalls do not smell nice. But I am not bothered by any of that. The thing that I find most difficult is that there is no soap provided, only sinks. I carry hand sanitizer for us, but when we are at a restaurant I really try not to think about how the people preparing our food do not have soap available to wash their hands with after using the bathroom! 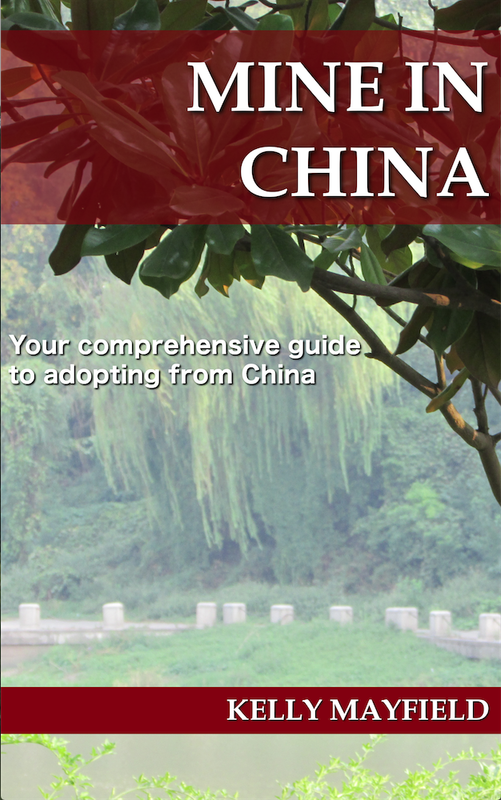 This entry was posted in Uncategorized and tagged China trip 2013 on August 31, 2013 by minefam.